"I live in the computer age and I love it here! I have long embraced pixels, multi-screen work stations and the information superhighway. I really can picture a paperless world. And yet, I grew up in a very different place. When I was born in 1960, paper was where great knowledge was recorded. in my house, all through the 1960s and 1970s, our family worshipped the World Book Encyclopedia---the photos, the maps, the flags of different countries, the handy sidebars revealing each state's population, motto and average elevation." When is it appropriate to show previews of rated 'R' movies before 'PG13' movies? Apparently if the movie business is marketing to teens. The first preview that is shown before the "Twilight" is called... I don't want to give the movie any free publicity but it is rated 'R' and it is SCARY!! It is about a girl who had a twin brother. You'll know the preview when a little boy hits the babysitter hard in the face with a book or something. The young teenagers I was with all screamed during the preview and talked about how scary it was at least 3-4 that night. Many wished they would have covered their eyes. It did lead to a good discussion on the topic of why the prophets counsel us not to watch rated 'R' shows and being careful with 'PG13' movies as well. The images that are in the girls heads from the preview left an lasting impression. A few even voiced concerns about having nightmares. Contest Time! I need your help! This is part of an email I'll be sending out to my friends. Since we're all friends here, please consider yourself invited to spread the word and win prizes! Send a message to five friends, or post something on your blog, and I'll enter you to win a $25 Amazon gift card. Just copy me or send the link to: contest @ suzannevreese.com. Even bigger prizes are available if you actually read the book and recommend it! Finally, one last favor to take note of: if you've decided to buy the book (just cause you love me or whatever) please do it ON DECEMBER 11 FROM AMAZON! See my website for a preview or more info! I was in bed reading and 3/4 of the way through Abinadi when I decided I should go to sleep. It's probably 11-11:30 PM, I thought to myself. I put the shut the book and looked at the clock. It was 1 AM. I couldn't put the book down! I needed to know what would happen to Abinadi, Raquel, and Alma. 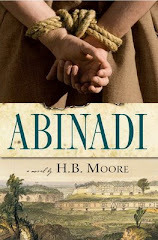 The story begins with a young Abinadi who has a small crush on a local girl who happens to be the daughter of a high priest in King Noah's court. King Noah is an adulterous, greedy whoremonger who bullies his court and people. He doesn't like being told he is sinning. He doesn't like being told he and his people must repent. And when Adinadi starts preaching about sin and repentance, King Noah doesn't like him. Today is Random Book Day. I randomly pick a passage or quote from a book I am reading. And you try and guess the book! 'Her mother was sorting through her things. She held up a set iridescent quetzel feathers. "Wear these in your hair with your turquoise and red tunic. Wrap it tightly so your figure shows." Raquel opened her mouth but was too surprised at her mother's words to answer. Her mother wanted her to impress the king! Raquel looked at her mother's face. Itzel wore a tight, pinched look---very task-oriented. She showed no emotion in preparing her daughter for this event. It was simply a duty. Here is a shout out to all the wonderful people I meet down at the new bookstore, Provident Book in PG! I spent large chunks of my Saturday hobnobbing with some of Utah's author. Local authors. One from Orem, one from Lehi, another from Sandy, all close enough to be my friend. Not that I am lacking in friends; they probably aren't either. But after I talked to a few of them I felt I could be friends with them. Besides being down-to-earth, fun and helpful, they didn't laugh when I said I wrote a book.So this is a plug for all the authors today who didn't laugh at me! Don't forget to visit the new LDS bookstore on state street in Pleasant Grove (near the PG rodeo grounds). Provident Book, 661 W State New & Updated Coupon! "Take courage-the magic is already inside you"
How many times do we wonder if we have what it takes to move forward, to conquer fears, to do a really hard task? Marcus and Kyja are finding out in Mr. Savages book, "FarWorld: Book One" and they must find their own magic. Is the magic strength, brilliant ideas, bravery, compassion or is it really magic? Mr. Savages book is a fun, intense, fast-moving fantasy. I had to keep reading because of the twists and turns the story takes. The book is good, clean reading with humor and lessons throughout. I enjoyed watching Marcus and Kyja grow and learn and come to terms with what they thought were their weaknesses. The book is obvious in pointing out black and white, good and bad, scary and safe. I will admit, the bad guys made me nervous! How do two thirteen year-old kids stay out of the clutches of evil and save their two worlds? We won't know until the NEXT book comes out! Are you done writing Book Two, Mr. Savage?? New LDS Bookstore Opening in Pleasant Grove UT The following message was sent to me by a reader and since I'm all about promoting LDS books, I decided I would post it here. I may regret this if I get bombarded with everyone who wants to promote their business, but I'm taking a chance and hoping it won't get out of hand. I know you don't usually do advertisements like this, but I thought perhaps you would make an exception in this case. There is a new independent LDS bookstore opening this weekend, November 8th, in Pleasant Grove, Utah. It's called Provident Book, and it's located at 661 W State, Pleasant Grove. It's just north of the PG Rodeo Grounds and in the same strip of shops as Timpanogos Cyclery. My DD and I loved "Keturah and Lord Death" by this same author. Her storytelling draws you into the story and keeps you there, rooting for the hero only for the story to take a different path. "Dollmage" is no different. Strictly fantasy, this story is about the storyteller of the village, the Dollmage. She is growing old and must have a successor. She predicts that on a certain day, the new dollmage will be born. And on that day, four children are born: two girls and two boys. She picks one girl over the other because of her pride has been hurt. The dollmage gives dolls that will bring comfort, peace, and tell of future promises. As in any village, there are certain laws and expectations. This village is no different. Promises are kept and very rarely broken because it is punishable by death. But who is to say that a promise given because another is extorted is a promise?